For 45 years, Total has provided families from Milwaukee to Chicago with quality furniture at deep discount prices. Family owned and operated, Total, with a pristine Better Business Bureau record, always goes the extra mile to make certain that every one of its customers has a positive buying experience. Most importantly, Total has proven that you do not have to overpay to have a home full of quality furnishings. Forty-five years ago this May, a young local man had a dream. The man was Frank DeAngelis, and the dream was to create an honest value-based furniture business. That dream had become the oldest, most established area store, Total Warehouse Furniture, located at 8400 75th Street in Kenosha, Wisconsin. DeAngelis began his career in the furniture business in 1963, working part-time at a local furniture store in Racine, Wisconsin. The furniture business started to seep into his blood and he found himself wanting to advance to working full-time. The longer DeAngelis worked in the business, the more it became a part of his life, and his next move just made sense. He realized that he wanted to help people transform their houses into homes with a great selection of stylish and affordable furniture. He felt he had no other choice than to open his own furniture store. It was quite an undertaking in 1970 for a young man to convert an old factory into a successful home furnishings store. The name "Total" Furniture comes from the idea of being able to bring the community a great selection of stylish and affordable furniture that could help their houses become warm, comfortable homes. In the beginning, DeAngelis was a one-man show. He ordered inventory, unloaded trucks, assisted customers, finalized sales, paid the bills, answered the phones and whatever else was necessary to become a success. In August 1970, working alone changed. In through the side door of the showroom walked a beautiful young woman with a business associate of DeAngelis'. Total Furniture carries a huge selection of mattresses! TOTAL FURNITURE Open four to save you more! 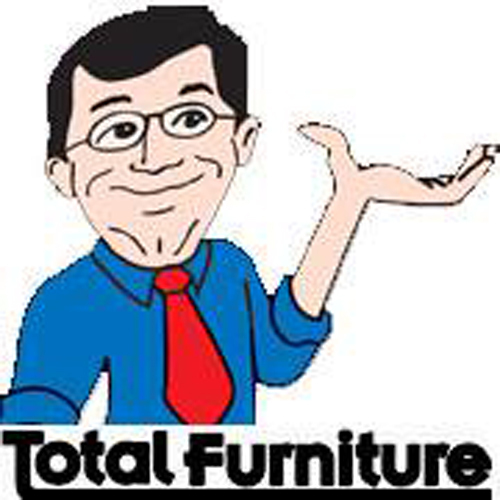 Total Furniture is SE Wisconsin's #1 furniture store for value, customer service and selection! Open Friday through Monday!